-Granny´s Kountry Candles Stress Relief in the bedroom (3 cubes, 24W hot plate). Now this was an awesome herbal scent however the intensity was so low that I had to use half a clamshell. Now I thought usually I use a 2oz scent shot from Granny´s whereas 3 cubes from the clamshell are only about 1.75 oz so to me it sounds about logic to use half a clamshell. To many users it may look uneconomical but for me that´s ok and pretty cost-effective however I might buy two 2oz scent shots rather than 1 clamshell next time as I think it comes out to be a few cents cheaper that way. Still not a product that blows me away. Will let the other 3 cubes cure a bit longer to see if the scent strength will improve as this was poured pretty recently. -The Bathing Garden Pretty Woman (2 cubes) in the first floor (24W hot plate). 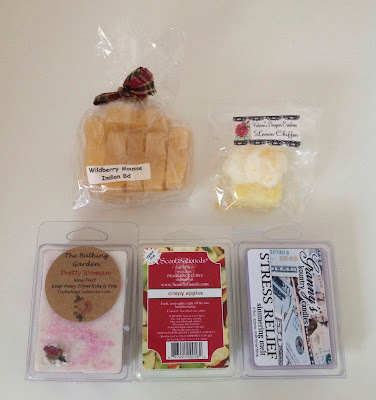 I am not a big floral person but I just mentioned in another daily melts post that I can take some rose scents. Pretty Woman is a nice powdery rose with a layer of creamy vanilla on top. They blend nicely into a creamy sweet rose scent with a strong throw and great lasting power. -Scentsationals Crispy Apples (2 cubes) in the kitchen (tealight). This was a totally overpowering headache-inducing fake apple scent. I had to pour it out after half an hour and replace it with something else as the scent made me sick. -CFTKR Wildberry Mousse Indian Bread (2 slices, 24W hot plate). While I love CFTKR I am slowly coming to the conclusion that I dislike most berry scents, especially sickly sweet ones like this. I had to pour this out and replace it as this made me sick, too. -VDC Lemon Chiffon in the living room (tealight). Nothing to write about this, it had zero throw! -Pics, Petals & Scents Apple Cider Bread (1 stick) in my kitchen (tealight). This was my replacement for that gross apple scent from Scentsationals. This was awesome, a slightly spice albeit not overpowering scent. It threw really well and lasted the whole tealight long (a 6-hr one). P,P&S is just an awesome vendor!! -CFTKR Serendipity Noel in the living room (24W hot plate). My replacement for the wildberry scent and it was awesome! 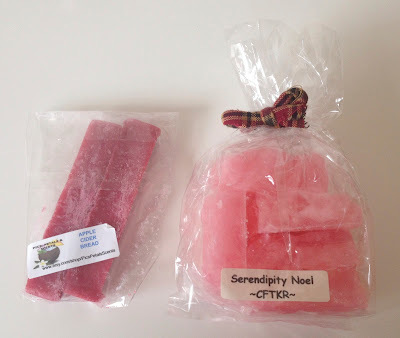 The serendipity wasn´t as sweet as the berry scent and the sweet vanilla bean note made it overall a yummy treat! Lasted all day long!